Angela Nguku, BScN, MA, MSN, is a passionate maternal, newborn and adolescent health champion whose career spans over 14 years of dedicated work towards ending preventable maternal and newborn deaths globally. 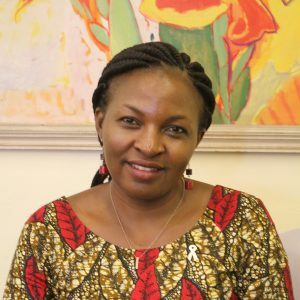 Angela is an experienced leader and programme management specialist in the Reproductive Maternal, Newborn, Child and Adolescent Health (RMNCAH) sector in Kenya, the African region and globally. She is an accomplished influencer and advocate and a passionate midwife who combines her proven influencing and negotiation skills in her advocacy for accountability work and has strategically campaigned for the health of mothers and newborns and the voice of midwives at different platforms nationally, regionally and globally. Angela’s’ proven track record of high level accountability work has seen her engage with politicians at local, national and international levels; holding government duty bearers to account for commitments made to mothers , newborns, children and adolescents in Kenya, Africa and globally. Angela’s career as a transformatory leader started back in 2005 in South Sudan while working where she was met with the sad reality of mothers dying daily because of a dysfunctional health system as a result of decades of civil war. She has since worked in different capacities within the RMNCAH sector and within different organizations across Africa, Asia and Latin America.